Emily trained at the world renowned British School of Osteopathy in Central London. Graduating in 2014, she returned to her home town of Sutton Coldfield, where she has been working as an Osteopath in the local community ever since. 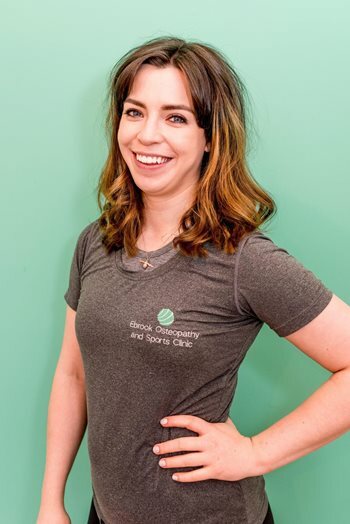 Since graduating Emily has also completed further training in Medical Acupuncture with the British Medical Acupuncture Society, and become a Clinical Pilates teacher. Emily has a strong structural approach to treatment, thoroughly assessing biomechanics and posture, as well as discussing work and sporting activities with her patients – before using that information to tailor her treatment plans to fit the individual. Emily treats a great variety of patients; from manual workers, to those in office based jobs. It is her belief that there is no body that doesn’t benefit from a regular treatment to remove the stresses and strains of daily life. A great lover of exercise, Emily practices Pilates, Yoga and Barre in her free time, as well as some more energetic TRX and weight training workouts. A solid understanding of these principals of movement influence her treatment of patients in clinic.